Throughout the world, estuaries and coastal waters have experienced environmental degradation. Present proposed remedial measures based on engineering and technological fix have been unable to restore the eco logical processes of a healthy, robust estuary and, as such, will not reinstate the full beneficial functions of the estuary ecosystem. The successful management of estuaries and coastal waters requires ecological engi neering, that is, an ecohydrology based, basin wide, approach. Ecohydrology is the science that relates hydrological processes to the biological dynamics of ecosystems at various spatial and temporal scales. The ecohydrology concept was developed in the frame work of UNESCO's International Hydrological Programme (IHP). It hypothesized and empirically confirmed in a number of demonstration sites that the ecological services of rivers and lakes can be restored by using hydrology to regulate biota dynamics and vice versa. The synergic integration at the basin scale of various ecohydrological measures based on ecological needs provides the scientific back ground for twinning ecosystem variables in order to enhance the carrying capacity and the resilience of ecosystems while promoting positive socioeconomic feedbacks. Implementing the ecohydrology approach necessitates getting away from present management practices based on regulation focused on the geography (e.g., individual municipalities or counties) or on individual, specific activities (e.g., farming and fisheries, water resources, urbanization, shipping) without integrating among local ities and users so as to consider the ecosystem. Without this change in thinking and management concept, estu aries and coastal waters will continue to degrade, whatever integrated coastal management plans are imple mented because these ignore the basic ecology fact that the land, the river, the estuary, and the coastal waters are connected by being in the same ecosystem. Can science based management save estuaries and coastal waters.? About environmental management the main thing that can be reliably managed is the human behavior and practices. The main thing that ecological engineers can do is to highlight the role of ecohydrology in offering a robust, science based way to quantify both the present human impact on the degradation of estuarine and coastal ecosystems and the likelihood of success of various remediation measures in improving the health of these ecosystems. Remediation measures include chan ging human behavior and practices in using the land and water resources. These measures also include boosting the ecosystem robustness by manipulating the ecosystems so as to reinforce the beneficial ecological feedbacks in these ecosystems. The eventual success of these measures relies on adopting an ecohydrological approach. Estuaries and coastal areas are traditionally among the most highly impacted waters. For centuries human popu lations have settled and have benefited from the services provided from these highly productive ecosystems. During the last century, the human population worldwide has increased by a factor of about 10 in coastal areas of many developing countries and probably a factor of 4 for most developed countries, as a result of natural popula tion growth and migration. As a result the carrying capacity of coastal ecosystems is exceeded and this has commonly led to a serious environmental degradation of estuaries and coastal waters worldwide. This is best demonstrated for the megacities and harbors in the Asia Pacific region where the best of engineering practices have failed to provide a healthy environment to 100 million people. In most sub Saharan African countries, migration to the coast is still increasing the coastal population yearly at typically 5-8% because coastal areas provide free access to food (fisheries) and timber (mangrove trees) and hope for jobs in harbors and coastal cities. In view of this ever increasing human impact on coastal ecosystems, corrective or preventive measures based on an ecohydrological approach should be considered instead of just engineering measures as has been the general approach so far. This does require changing the legislation that is a quagmire for the management of estuarine and coastal waters. The successful implementation of an ecohy drology approach to managing estuaries and coastal waters must be based on a sound scientific knowledge of the ecosystems functions and dynamics. The ecohydrological approach has been tested suc cessfully in various locations and systems (salt marsh estuary, mangrove estuary, and coral reefs) around the world, particularly in the Guadiana Estuary in temperate Portugal and Darwin Harbor and the Great Barrier Reef in tropical Australia. The health of these ecosystems was demonstrated to depend on the connectivity between estuarine and coastal waters, on the links between physi cal and biological processes, on the drainage basin hydrology, and on the disturbance caused by human activities. It was possible at these sites to quantify the human impact on the ecosystem health, and the impact of remedial activities. Major observed impacts in estuarine and coastal eco systems are the increasing eutrophication risk, toxic algal bloom events, muddiness and siltation of estuaries and coastal erosion, and also modifications in biodiversity resulting in the loss of traditional ecosystem services (e.g., coastal fisheries) and having negative socioeconomic impacts (e.g., the loss of income and employment for coastal communities). The degradation is most dramatic for coastal coral reefs located within the estuary and in its coastal waters (Figure 1 ). Coral reefs possess the highest diversity of any marine and most terrestrial ecosystems and they greatly benefit humanity by building islands and atolls, by protecting shorelines from coastal erosion, and supporting fisheries and diving related tourism. Coastal reefs are being destroyed at an accelerating and unsus tainable rate worldwide (e.g., up to 50% in the last 15 years in some Asian countries) by human activities that can be devastating (e.g., mining for limestone, fishing with explosives and cyanide, infilling for urbanization) or threatening but possibly manageable (e.g., increased run off of mud, nutrients, and pesticides from adjacent river catchments, overfishing, and global warming). The pre sent coral reef strategy principle relies on drawing a line around coral reefs and protecting the corals inside that line. It is politically convenient and it ignores the fact that the land and the reef are ecologically connected through the rivers. It thus invariably fails worldwide wherever the reefs are impacted by runoff that is modified in quantity and quality by human activities on land. Figure 1 The physical submodel schematizes the estuary as a series of cells connected to each other by advection driven by both the river discharge (straight thick arrows) and the salinity-induced currents (broken thin arrows) and by tidal mixing (curved arrows). The open boundary conditions are located at the tidal limit where a riverine flux of water and waterborne particles is imposed, and at the mouth where an oceanic flux is also imposed. The estuary also exchanges water and waterborne particles with the wetlands (perimarine wetlands, mangroves, and salt marshes) and the seagrass and the coral reefs. The suspended solid concentration (SSC) commonly has its largest value in the turbidity maximum zone. The salinity increases in the estuary toward the mouth. blooms, in both the marine and freshwater regions of the estuary. However, bivalve excretion increases the pool of nutrients available for other primary producers as the macroalgae like Ulva sp. or the colony forming Phaeocystis sp. Studies also provide evidence that changes in the river discharge impact on the structure of estuarine plankton, fish, and bivalves communities. In fact, the response to low flow periods has been recognized as one of the most important factors in structuring biota, both in the estuary and coastal waters. During low flow periods, a decrease in the concentrations ofthose nutrients reaching the sea may occur, especially in dammed rivers, since the silicates (Si) trapped in the dam is not reintroduced downstream in the system, as may occur with N and P (as consequence of the use of fertilizers in agriculture). In such situation, Si can be limiting to the growth of diatoms, and may contribute to the occurrence of toxic algal blooms. The reduction of low flows by dams and irrigation is thus a threat to the health of estuarine ecosystem. Estuary and coastal waters following high discharge peri ods, catches are dominated by planktivorous fish like the anchovy (Engraulis encrasicolus) and the sardine (Sardina pilchardus). This is because high river discharges promote primary and bacterial production from increased nutrient loading and organic matter loading. They also increase larval and juvenile survival because higher turbidity asso ciated with greater sediment loads reduces predation. They facilitate the retention of early life history stages and increase the survival. They provide an environmental clue (salinity gradients) for shrimps and fish to migrate towards the estuary where tidal wetlands (salt marshes and man groves) are used as a nursery for the larvae and juveniles. In areas where the continental shelf is narrow, the effects of freshwater runoff can reach the upper continental slope, especially during upwelling events, increasing larval phy siological condition and consequently decreasing larval mortality. These larvae can find abundant food in winter because during this rainy period the freshwater discharge is usually high, promoting salinity stratification and the devel opment of a shallow surface mixed layer where phytoplankton that can bloom long before the spring phy toplankton blooms occur. These examples show that the regulation of estuarine and coastal biota processes is highly dependent on the river discharge. This offers politicians and water resources man agers the option to try to improve estuarine ecosystem health on a case to case basis by modifying mostly one variable. Figure 2 (a) The biological submodel for the Guadiana Estuary, Portugal. The salt marsh is modeled as a source of detritus and juvenile bivalves (broken arrows). At death all organisms become detritus (not shown). SSC, suspended solid concentration. 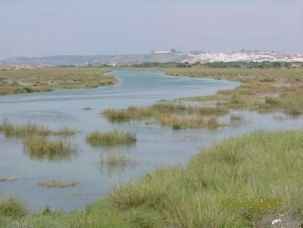 (b) Photograph of Guadiana Estuary salt marshes and encroaching urbanization in the background. The estuarine ecosystem modeler is faced with com plex processes and feedback processes between the physics and the biology, which in practice cannot be fully quantified because the data are inadequate. For this reason, models should only be used as tools that help to explain the reality, steer field researchers towards study ing key processes that most control estuarine health, and help quantify the impact ofhuman activities on the health of estuarine ecosystems. Models should not be seen as able to replace reality and the need for field observations. Governments often want to cut budgets for field research and instead promote the cheaper option of modeling. Estuarine ecosystem models are simply unable to provide reliable answers without field studies. Estuarine ecohydrology models are based on the knowledge and quantification of physical and biological processes controlling the ecosystem. They can quantify the likely effectiveness of ecohydrology solutions for eutrophication by two opposite ecological approaches, namely top down control on vegetation by herbivores, or bottom up control of nutrients loads. They can also quantify the likely effectiveness ofdealing with eutrophi cation by regulating the river flow, for example, allowing freshets. The control ofnutrient input into the system can be obtained by creating or restoring wetlands, which will act as buffers and trap nutrients. These wetlands, when located near the coast, also protect the coast from erosion, thus protecting inland infrastructures and coastal popula tions. The cumulative effect of wetland creation and controlling the riverine nutrient loads through changes in land use practices invariably lead to an efficient decrease in nutrients in the estuary, often larger than the sum of the two impacts individually. 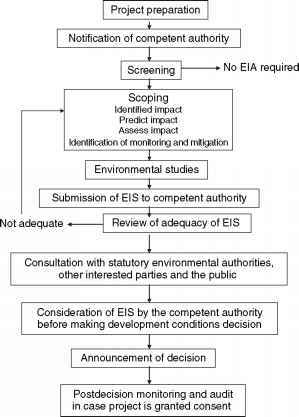 For each of these solutions and for each case, models should be used before field implementation of the remediation activities to assess likely improvements in the health ofthe ecosys tems and to compare these with observations, so as to be able to separate human from climate effects. A top down approach can be considered and modeled for control ofeutrophication, that requires the knowledge about the ecological food web in the area: who eats who, when, and how much. The quantification of these pro cesses and relations is basic to the selection of the most effective grazer species. In some cases manipulation ofthe food web could be necessary, for example, (1) controlling the density of the predator species; (2) allowing the her bivore species - that will control the vegetation growth -to become more abundant, and (3) introducing bivalves to filter the water and reduce the risk oftoxic algae blooms. Such is the case in San Francisco Bay where eutrophica tion is inhibited because half of the water is filtered daily by bivalves that were accidentally introduced. Toxic algal blooms are frequent in nutrient enriched estuaries and, in particular, in dammed estuaries, and estuaries with reduced flushing and very long residence times. For instance, Tokyo Bay in Japan and the Pearl River estuary in China have respectively about 100 and 200 days oftoxic algae blooms every year in various areas. Bivalves have been successfully tested to control phyto plankton blooms and reduce eutrophication and toxic algal blooms. Another way to control algal blooms is to generate freshets (i.e., freshwater discharge pulses). During freshets, with the duration of typically few days, the amount of nutrients available for phytoplankton growth increases, causing a decrease in competitive exclusion mechanisms and the consequent increase in phytoplankton diversity. In turn this promotes the growth and the diversity of zooplanktonic species. Consequently, more zooplankton species may play a regulatory role by controlling phytoplankton density and 'avoiding' the phy toplankton growth of just few species, therefore reducing the risk of toxic algal blooms. The use of freshets to control algal blooms requires a profound knowledge of the system on a case to case basis, in order to determine the timing, the magnitude, and the duration of the freshet. A poor timing of freshets could negatively impact species that use the estuaries and its tidal wetlands as a nursery ground, if the freshet interferes with the natural recruitment of these species, for instance by flushing out the eggs and larvae. Estuarine ecohydrology models have been developed and verified for few ecosystems, recently for the Guadiana Estuary in Portugal and Darwin Harbor and the Great Barrier Reef in Australia in a program sup ported by UNESCO ROSTE, NOAA, AIMS, and the University of Algarve/CCMAR. The explicit aim was to offer science based solutions to management. The ecohy drology models due to its holistic approach is a tool that aims to facilitate an interaction between scientists, econ omists, the public, and decision makers to promote the ecologically sustainable development of an estuary and its coastal waters. is shown in Figure 2 and that for Darwin Harbor in Figure 3. Figures 2 and 3 show the minimum level of complexity of the model that is necessary to capture the ecology of these estuaries. There are important features that are found in both temperate and tropical estuaries, namely (1) the importance in turbid waters with a very long residence time of the suspended solid in releasing for biological productivity particulate nutrients, (2) the dom inance of the microbial loop especially near the ETM zone, (3) the role of detritivores and bivalves, and (4) the role of wetlands as a source of detritus as well as mainly a nursery ground. These tidal wetlands are made up of mangroves in the tropics and salt marshes in the temperate climates. A key commonality also is the impor tance of river floods, even short lived ones, in attracting coastal fish to migrate up estuary by kinesis or taxis by swimming following environmental clues, primarily sali nity gradients. The model has been successfully verified against field data for these two estuaries.